Recommended to: Readers who enjoy Elizabeth Scott! This book embodies everything readers love about her. Before you shake your head and turn away at the premise of this book, let me tell you that I did the same thing initially. I love Elizabeth Scott's writing. Her books are instantly added to my TBR whenever a new one comes out. Still, I wasn't sure about Heartbeat. A woman being kept alive for her unborn baby? Really? Then I headed out to the almighty Google and did some research. It's real. Oh, it's real. All of that aside, this is a genuinely beautiful book. Emma's life is in shambles. Her mother is dead, her stepfather is broken inside, and she's all alone. Drowning in grief is hard enough. Doing it while feeling alone? That would shatter anyone. I liked Emma's character. Her feelings were so palpable, so easy to understand. I'll admit that there were times when I felt she was being just a slight bit overdramatic. I had to step back and remind myself that Emma was a teenager. I'd probably have done the same. Caleb is what really sealed the deal for me. His story, even more than Emma's, blew me away. I won't tell you what it is. I will tell you that it broke my heart. He completely stole the show. Where Emma was sometimes over the top, Caleb was quiet and reserved. His hurt simmered on the inside. Both aching and lost, Caleb and Emma were such a perfect pair. I teared up more than once, watching them heal one another. I love Scott's ability to write such amazing characters. Dealing with the ideas of mortality, love, and self-worth, Heartbeat is a gorgeous book. 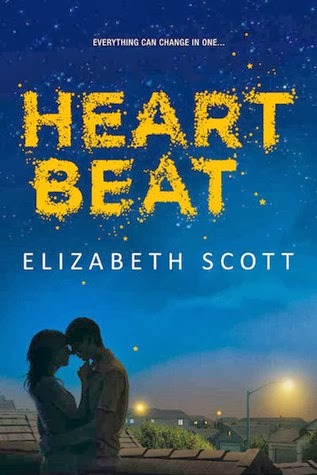 If you're a fan of Elizabeth Scott, this should absolutely have a place on your reading list. If you're not, what are you waiting for? Grab a box of tissues, find a comfy spot, and dive right in.